By the relationships which [the Architect] creates he wakes profound echoes in us, he gives us the measure of an order which we feel to be in accordance with that of our world…. it is then that we experience the sense of beauty. —Le Corbusier, Towards a New Architecture. The letter accomplished its task, and in November 1959, the then-72-year-old architect descended upon the red-brick low-lying textures of Harvard Square. Sert’s hints were soon made clear: During this trip, he would convince Le Corbusier to design a landmark new center for design and other arts at Harvard—what would become the Carpenter Center. For several years Harvard administrators had discussed the merits of a single locus point for the arts at Harvard. In 1956, the authors of the Report of the Committee on the Visual Arts at Harvard University, also called “the Brown report” after its chair, John Nicholas Brown, wrote, “The time has come for a new sense of direction and renewed purpose if the study of art at Harvard is to flourish in the coming years.” A single building that would house all the arts was an integral part of this vision. The project, then known as the Visual Arts Center, was financed by a $1.5 million donation by Alfred St. Vrain Carpenter, Class of 1905, and his wife, Helen Bundy. Even after the funds were secured, the question of who would design the building lingered and Le Corbusier was far from a given. The Swiss-born architect had spent his formative years traveling around Europe, eventually settling in Paris in 1917. When he left for Cambridge in 1957, he still lived in the headquarters he had occupied since 1922, in a former Jesuit monastery at 35 Rue de Sèvres, on Paris’ Left Bank. He continued, “We feel you will be able to set a new pattern for this type of university building in the United States”—even though the Carpenter Center would be Le Corbusier’s only project in North America. While many of the Center’s attributes would be consistent with Le Corbusier’s general oeuvre, several of its features derived from the architect’s first 1959 visit to Cambridge. He apparently found the hourly flurry of students in Harvard Yard striking, as they darted through intersecting pathways from one class to another. The distinctive ramp of today’s Carpenter Center is a legacy of that inspiration. This “climbing street” would also signal a nod to and link with Harvard’s architectural past along the Yard. Nevertheless, many objected to the Center’s modern look, finding it jarring against the steady brick tradition of the rest of the Square. But Le Corbusier insisted that freedom, innovation, and creativity must define a building devoted to the arts. At several points he balked at suggestions made to him, spraying his letters to Sert with exclamation points and irony in his characteristic obstinacy from his home base of Paris. 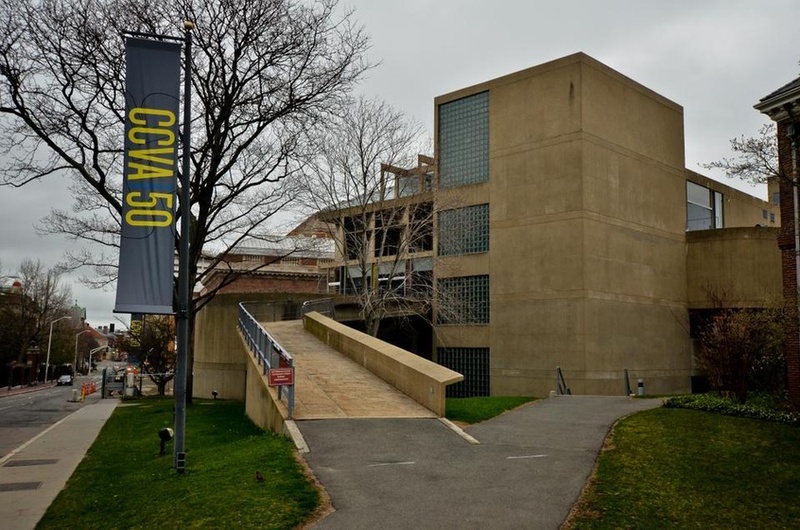 Clashes between architect and critics continued through the opening of the Carpenter Center, on May 27, 1963, as Harvard administrators showered champagne onto the barely dried concrete. Fifty years later, the Center is no longer the only building in Harvard Square to contrast the College’s longstanding red-brick tradition. It continues to be a relic of a certain vision sprinkled throughout Le Corbusier’s designs around the world. The Center’s glass walls, for example, can be traced to the architect’s Paris Salvation Army project from 1920; its glass blocks find an echo in Paris’ 1930 Cité Universitaire. Le Corbusier’s interest in sun and light, consistent throughout his architectural projects, can be seen in the Carpenter Center through the shadows that changed depending on the time of day. Recently, architectural historian Eduard F. Sekler spoke at the GSD’s Gund Hall to honor the fiftieth anniversary of the Carpenter Center. Sekler, the Center’s first director, recalled, “A lot of the traditional professors thought it was a disgrace.” Le Corbusier’s obstinate response came in the form of the Carpenter Center itself—and despite the initial outcry, and the continued criticism, the building signaled at least the momentary triumph of modernism in the arts at Harvard.